Specimens of 38 of the finest type families in the world are brought together in Typographic Specimens: The Great Typefaces, making it an invaluable reference tool for graphic designers, editors, art directors, production managers, desktop publishers, and students. Each type family is shown in display and text specimens with complete fonts including italic and bold variations; extended families such as Futura and Univers include additional type weights and widths. Each type family's section opens with a full-page experimental design, created by an outstanding graphic designer to demonstrate its potential. The specimens are accompanied by a concise discussion of each type family's origins, charactertistics, and usage. Typographic specimens provide an opportunity to study typefaces, to select and plan typography, and to increase one's knowledge of letterforms. Drawing and tracing specimens remain excellent ways to understand type and create logos and other typographic designs. Study of specimens aids in the selection of fonts to be purchased for the font library. Typographic specimens introduce unfamiliar typefaces in printed form and aid in the development of connoisseurship. Comparative analysis of similar faces in printed form becomes possible. Over one hundred prominent designers and design educators were sent a ballot listing all major typefaces and were asked to vote for the type families that best fulfilled their personal criteria for typographic excellence. 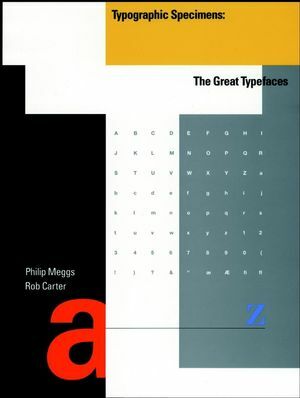 The typefaces contained in this book represent the results of this poll, providing a compendium of excellent typefaces that have stood the test of time. Typographic Specimens: The Great Typefaces will provide information, inspiration, and a keener knowledge of typography. Philip Meggs is professor at Virginia Commonwealth University, contributing editor of Print magazine, and visiting graduate faculty at Syracuse University. He is the author of Type & Image and A History of Graphic Design, and coauthor of Typographic Design: Form and Communication. His design work has been exhibited widely, including Print Regional Annual, CA Annual, Graphis Posters, Photographis, and The New York Art Director's Club. Rob Carter teaches typography and graphic design at Virginia Commonwealth University. His design projects have been exhibited by the American Institute of Graphic Arts, New York Art Director's Club, Society of Typographic Arts, Graphis Annual, Creativity, and the New York Type Director's Club. He is the author of American Typography Today and coauthor of Typographic Design: Form and Communication.